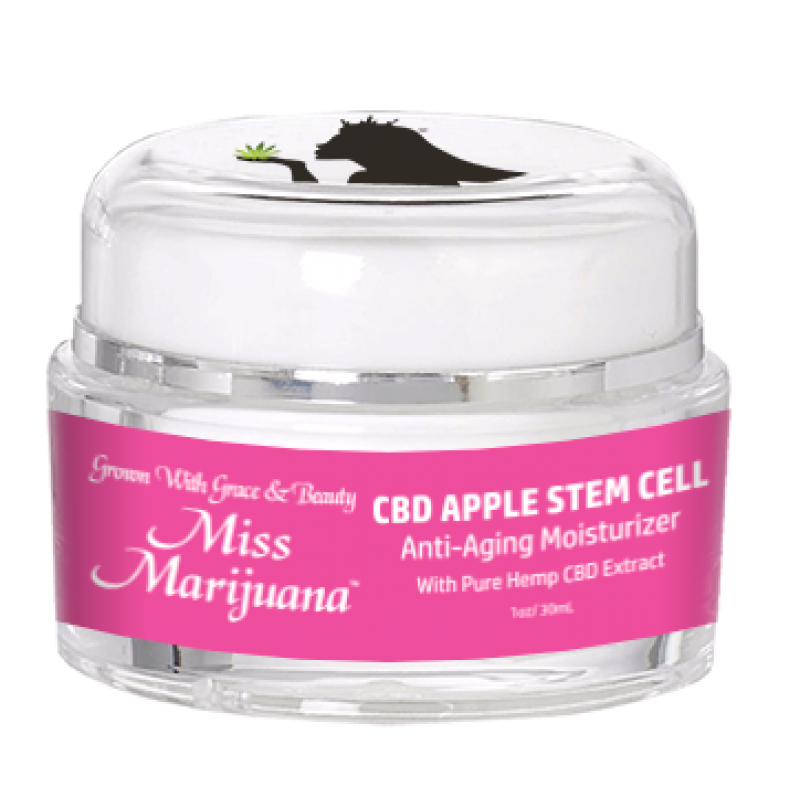 Miss Marijuana CBD Apple Stem-Cell Anti-Aging Moisturizer is a breakthrough in anti-aging and offers powerful regeneration of healthy skin cells! Our new combination anti-aging cream combines Apple Stem Cells with CBD. This revolutionary cream delivers fast results, while promoting natural healing to your skin. This cream is a game changer, as it works wonders for the face, neck, shoulders and upper chest. With the added benefit of stem cells derived from a rare apple tree, our cream can help slow, and even sometimes reverse, signs of aging when it is combined with the miraculous benefits of CBD. Even more, CBD Anti-Aging Cream with Apple Stem diminishes the appearance of fine lines and wrinkles, preserves the stem cells in your skin, promotes both vitality and longevity in the skin’s stem cells, combats age related skin degradation and promotes the regrowth of healthy skin cell formation! Ingredients: Purified Water, Glycerin, Caprylic/Capric Triglyceride, Persea Gratissima (Avocado) Oil, Butylene Glycol, Malus Domestica (Fruit Cell Extract), Chinesis (Jojoba) Seed Oil, Stearic Acid, Cetyl Alcohol, Glyceryl Stearate, Peg 100 Stearate, Dimeticone, PCR Hemp Oil, Aloe Barbadensis Extract, Peg-16 Macadamia Glycerides, Octyldodecanol, Propylene Glycol, Zea Mays (Corn) Oil, Tocopheryl Acetate, Cholecalciferol, Retinyl Palmitate, Ascorbic Acid, Pyridoxine HCI, Silicate, Sodium Propoxyhydroxipropyl Thiosulfate, Silica, Polysorbate 20, Phenoxyethanol, Caprylyl Glycol, Potassium Sorbet, Hexylene Glycol. Suggested Use: Apply a dime sized amount to clean skin on the neck and décolleté area. Massage gently into the skin for thirty seconds. Use in the morning and at night.